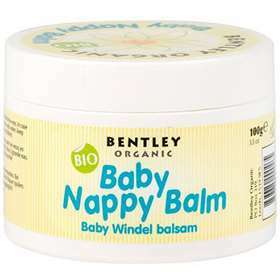 Bentley Organic Baby Nappy Balm 100g is free from harmful chemicals and is made out of the finest natural ingredients. This formula is gentle on skin and is biodegradable. Paraben, alcohol and fragrance free. Apply gently to clean, dry skin as part of your nappy change routine. Avoid contact with eyes, if this occurs rinse with water. Helianthus annus (sunflower) seed oil, Cera alba (beeswax), olea europaea (olive) fruit oil, zinc oxide, chamomilla recutita (matricaria) flower extract, anthemis nobilis (chamomile) flower oil.